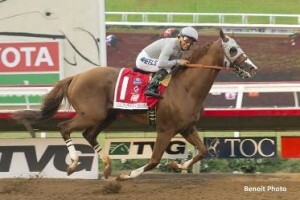 California Chrome the leading Thoroughbred in North America with earnings over $13 million continues to remain in first-place in this week’s NTRA Top Thoroughbred Poll. The all-time leading money earner in the U.S., California Chrome has led the poll for all 27 weeks of 2016 voting, clinching this week’s tally with 43 first-place votes and 430 points overall. The past weekend of holiday racing made for some light jostling in the order of the top-ten resulting with Frosted (249) dropping from second to fifth in the rankings after being defeated in the GI Woodward Stakes at Saratoga where he finished a respectively third. Mark Casse trainee Tepin moves back into second with (338) while Flintshire moves up from fourth to third (319) for trainer Chad Brown who earned his first-ever training title at Saratoga Race Couse while setting the record for most wins during a meet with 40. It is anticipated that Flintshire’s next start could come in the GI, Joe Hirsch Turf Classic Invitational on October 1 at Belmont Park. The undefeated 3-year-old filly Songbird, (306) with a perfect total career of ten starts with ten wins moves up a notch from to fifth place. The Eclipse Award champion could possibly make her next start in the G1 Cotillion Stakes at Parx Racing, September 24. Travers Stakes winner Arrogate (191) retains sixth place while three-time Eclipse Award champion Beholder (175) remains steady in seventh place. The remaining top 10 is rounded out by: Melatonin (55); Cavorting (50) and Nyquist (42).